You just started your first day at your local automotive dealership. When you arrive for your first day of work your boss comes up to you, leads you into a small room and hands you a pile of brochures and a video tape and leaves you there all day to study. When you are done he walks you over to a desk and says, go sell. Imagine if that was all the training you received. Many dealerships do this. That was my first day in sales at the dealership when I started selling back in January 1996. Previously I had worked in the insurance and investment field for two years. Prior to starting in insurance and investments I had to study for a state regulated and federally regulated test to receive my Life, Accident, Health License and my Series 6 Investment License. I spent months learning the material to be able to help clients with their insurance and investment choices. It was a big deal. Now, as I started a new career I questioned myself as to whether a day of watching a short video on how to sell and studying brochures for a few hours would be the right training for me to go out there and SELL! SELL! SELL! I was in sales and all I really had going for me was my outgoing personality and my desire to make some money. With little training I did pretty well for myself. I was selling on average eight cars per month, but I needed more. I felt I was lacking something to take me to the next level. After three months I moved to another dealership. There it was the same story. I was handed some brochures but this time I was given a packet that briefly outlined a four step sales process. I remember the steps were; Qualify, Present, Demo, Close. Now imagine yourself going into the dealership for your first day of work and you are placed in a two week training session. In that session you learn more than just how to sell cars. In that two week training session you learn the needs based sales approach to selling cars. You learn to take care of your customers and provide excellent customer service so that they would repeat purchase and refer everyone they know to you. You learn how to understand the wants and needs of your customers, and present the right vehicle based on those needs. You learn how to close like a professional while making the customer feel like it was their idea to buy. You learn how to follow your lost opportunities so that they would eventually come back and buy from you rather than the competition. Why is it that people would rather go to the dentist and have a root canal with no Novocain than go shopping for a vehicle? It is because of the lack of professionalism displayed by the dealership sales people. But, is it really their fault? As I learned each dealership has its own approach. Some dealerships have deeper pockets and have devised their own advanced training programs. They are “on the ball” when it comes to training. Others just don’t have the resources for a training program and have “dropped the ball” when it comes to training their sales staff. It is very appalling that a major profession that supports world economies does not have any formal training program for its professionals. There are no classes at major universities for an Automotive Sales or an Automotive Management degree. Manufacturers offer some paid training courses but for the most part they leave it to the individual dealerships or automotive group to train their sales force. As a manager and coach for a top 20 automotive retailer, Tim Northburg knows what it takes to be successful. Drawing on his experience of over fifteen years in sales and management, he has devised 11 essential elements to comprise this training guide book for sales consultants who want to take it to the next level. Automotive Sales 101 takes a sales consultant step-by-step through the important elements of the automotive retail business. If you are new to the business this book will help you learn the basic skills and techniques that will rapidly increase your ability to become successful right away in automotive sales. If you are a veteran, this book will help you sharpen your skills. The information, skills, word tracts and techniques offered in this book has stood the test of time. Many of these principles have been used for years and are tried and true. Other principles have been adapted and updated for today’s buyer. Use this book to learn the steps to a sale and effectively discover a customer’s wants and needs, select and present the right vehicle with authority, demonstrate the vehicle with enthusiasm, use an effective trial close, ask for the sale, negotiate effectively and close more deals by overcoming your customer’s objections. 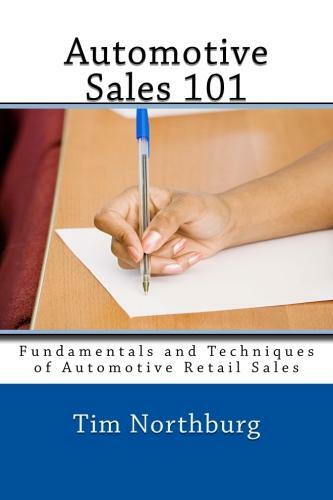 If you are starting off in Automotive Sales and want to learn the trade Automotive Sales 101 is the book for you! "Automotive Sales 101" is a follow-up guidebook to "Automotive Sales Playbook": that builds upon techniques previously introduced in "Automotive Sales Playbook." This automotive sales book is a complete training guidebook that teaches intermediate fundamentals and techniques of Automotive Retail Sales. This book is aimed at those professionals who have some experience in the business or those veterans who want to learn additional needs based selling skills. So, increase your knowledge and increase your sales!